Singapore, also known as ‘Lions City’, is the most diverse, enthralling, friendly nation with spectacular beauty. It captivates you completely. The education opportunities in Singapore and its flexible structure impress all. 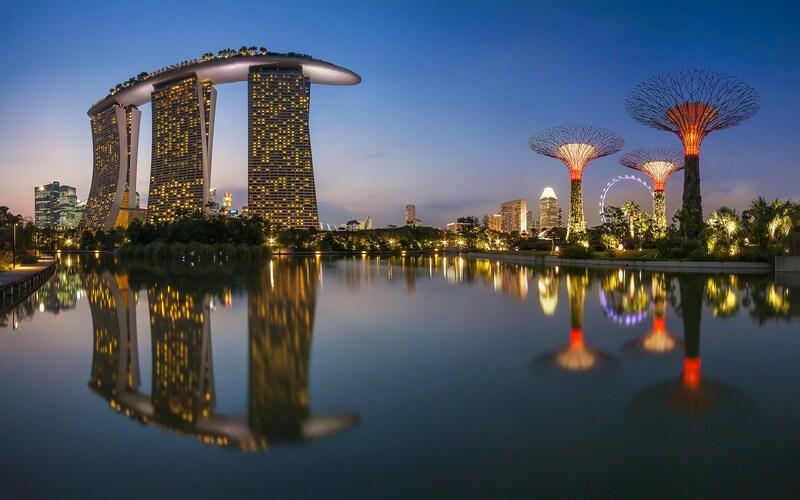 Considered as the heart of South-East Asia, Singapore is a picturesque, culturally-rich and diverse city-state. Lying at the southern tip of Malay Peninsula, Singapore never fails to mesmerize you with its beauty, charm, warmth and aroma. The nation is highly urbanized and has developed rapidly in the recent past, emerging as one of the ‘Four Asian Tigers’. Discussing Singapore demographically, the country’s population is pegged at 5.31 million. Singapore is the multiracial and multilingual nation with a maximum population of Chinese with minorities of Malays, Eurasians and Indians. Singapore is known as the second densest sovereign state after Monaco city-state of Western France. Being highly diverse in nature, Singapore follows no single set of culture. Talking about the climatic conditions, Singapore has a tropical type of climate. It experiences sunny weather with no definite onset of seasons. It experiences uniform temperature, high humidity and rainfall throughout the year. Singapore has a land area of 276.5 million square kilometers (sq. km) presently. The country’s territory has significantly increased due to heavy land reclamation in the recent times. An increase of 40 million square kilometers (sq. km) in Singapore’s territory is projected by 2030. Singapore is made up of 63 islands, including the main one widely referred as Singapore Island or Pulau Ujong in Malay. Singapore is the one-city state. It has no cities, but scenic towns encourage its beauty. Some major towns worthy to visit are Ang Mo Kio, Bedok, Toa Payoh and Choa Chu Kang amongst others. In the recent past, Singapore has emerged as the most favored business centre throughout South-East Asia. Regarded as one of the grand commercial hubs, it has fourth biggest financial centre and five busiest ports. The nation draws almost 26% of its GDP through the manufacturing sector. Singapore has third-highest per capita income in the world which boosts the purchasing power, but high-income inequalities cannot be ignored. Singapore is small in size and has high population density. Roads here are not flooded with private vehicles to curb population and traffic congestion. To commute from one place to another, Singaporeans use public transport such as bus, taxis and train. People here also prefer to walk or ride a bicycle to get to their destination. The official languages of Singapore are English, Malay, Mandarin and Tamil. But most of the operations and activity are conducted here in The English Language. In its long journey, Singapore has emerged as one of the highest and stable metropolia in the world. From business to beauty, from development to diversity, Singapore has all in it. Its beauty is ever ready to engulf you and show you the world you have never seen. For a country its size, it is commendable on the part of Singapore to incorporate everything into its culture and environment. The student-friendly atmosphere, no barriers, scholarship, huge career opportunities, amazing workplace and the quality is what makes Singapore the best out of the rest. An excellent education with all necessary facilities at affordable rates is the key to the success of Singapore. The education sector of Singapore is striving hard to give best to both national and international students. The Government of Singapore is leaving no stone unturned to achieve the desired goals and earning recognition globally. The education system in Singapore is giving more and more opportunity to its students to learn more. The students here feel free to explore which enhances their creativity and problem-solving tactics. Singapore has worked harder to achieve its present position and hence it believes in giving equal opportunity to everyone who wishes to succeed in their life. The Government of has done a fantastic job as far as its university education is concerned. Being a nation having per capita GDP more than The US, the government has burnt the midnight oil to stand out excellently for national and international students. Singapore has become the first Asian nation to build up space for itself in ‘Top 10’ of ‘Universitas 21 rankings. The country begged ninth position in the list and gained acknowledgment throughout the world. The National University of Singapore, which has given some memorable experiences to global students, has been consistently ranked the best in Singapore and across Asia. The another university of Singapore, ‘Nanyang Technological University’, is among ‘Top 50’ in the world. Singapore has a great emphasis on vocational education and provides training round the corners to make their students grow admirably. One of the most famous institutions in Singapore for vocational studies is ‘Institute of Technical Education’ (ITE). Students who wish to pursue vocational courses can go for polytechnics or ITE, where they can receive their diploma. Singapore offers a free environment and opens all the doors of learning. The education system is quite flexible and supple. Training for students is yet another boon for national & international students. In Singapore, there is pre-university training and post-university training to access the ability of the students and give them what is worthy out of its kitty. School Education in Singapore is successful, encouraging and properly organized. Due to the presence of many cultures, Singapore is a host to many international and private schools. Singapore schools do not believe in teaching but learning to the hilt. They prepare a student for the complex scenarios and perplexity that the 21st century demands. Over these years, Singapore has the broad range of the powerful set of institutions which excels in education. Singapore’s school education is a product of unique institutional and cultural influences that impart quality education and make life more disciplined. Schools in Singapore have best teachers and aim at capacity building at all the levels. Teachers here believe in transmitting their knowledge to the students in best possible way and work rigorously to derive the desired goals. Singapore education is mainly undertaken in ‘English Language’. It is firmly committed to training its students to face the challenges globally and understands the significance this language carries in business opportunities. The English Language Institute of Singapore (ELIS) aims to impart excellent English communication skills and raising command in both spoken and written English. It aims at strengthening and driving excellence in teaching and learning of English Language. It works towards making Singapore a hub of English language. ELIS encourages participation of experts in their field for a particular duration to provide the full range of English language learning courses and useful tips to the students. Apart from ELIS, there are some other English language schools in Singapore which believe in giving an insight to global trends and motivate innovation in English learning. If you would like to study to your country of choice, we can help. We are the specialist in education consultancy and coaching (IELTS, TOFEL and Spoken English). Please feel free to contact us for further details.